.Quilling paper flowers are incredibly lovely on their own. They can be as delicate as a daffodil or as hearty as a sunflower. But nothing will make your botanical scenes look more realistic than adding some leaves and greenery. Now, you could just make a few swirls and call it a day, but why not make those designs more lifelike? Today, I’m sharing 5 types of quilling paper greenery to really jazz up those flower scenes! 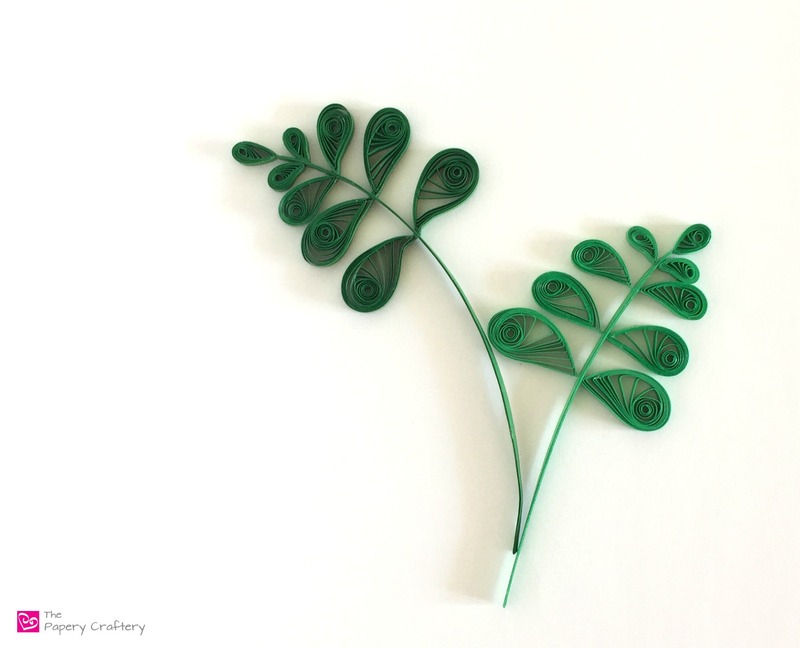 Just like most quilling crafts, paper greenery can be quickly formed from simple shapes. They can be as easy as adding a few marquise or teardrops to quilling paper strip stems. TIP: Try using an odd number of quilled shapes in your greenery. Odd numbers look more natural! Big, beautiful fern fronds are made with multiple rows of shaped teardrops. The important thing to remember with ferns is to make the teardrops a little bigger as you go. For example, in the ferns below, I rolled 3 6″ coils for the tip and the first row, then 2 10″, 2 15″ and lastly, 2 18″ coils. If I wanted to make the fern fronds longer, I would have just made larger and larger coils. A quilling circle template will be really handy making the ferns and other types of greenery. It will help keep those coils and shapes nice and even! I’m really fond of the idea of making a scene based off these quilled wheat stalks. Maybe it’s all the farmhouse decor that’s out there right now influencing my mind, but I think they’re so rustic and lovely! These wheat stalks are much simpler to make than they look. Roll an even number of 4″ strips of pale green paper, and shape them into marquise. Using a small dot of glue, attach one to either side of a darker green stem. I made this stem out of 4 layers of leaf green to make sure it would stand up well. After gluing each marquise, add a 1 1/2″ strip to the bottom of each, curving them slightly so they point towards the top of the stalk. There is a slightly more complicated technique to make wheat using a quilling comb, but I find this to be a bit quicker with similar results. If you’re looking to add a bit of aging to your wheat stalks, try making them from tan quilling paper. Quilling paper greenery with a little bit of dimension is always a great idea! Try rolling 3 tight circles and molding them into domes. They’ll give the illusion of budding leaves to your design. You could also switch it up by squeezing those domes into teardrops. These are perfect to tuck underneath blooms and blossoms! I hope these 5 types of quilling paper greenery have inspired you to add a little extra life to your flowers! And there’s plenty more leaves where these came from. I’m planning on making this a bit of a series. So stay tuned for the next post like this in a few weeks! Great, Laurie! I hope they’re helpful to you! I am so happy I found your site! I am a new quilter and I love your simple and beautiful designs. Thank you for sharing 😃. Welcome, Christine! I’m so glad you’re here, too 😊 my goal is to encourage the new and intermediate quillers by keeping things simple. Quilling doesn’t have to be so intimidating! If you ever have any questions or comments, feel free to reach out to me at meredith@thepaperycraftery.com. Wow, I have never heard of quiling paper but these are so amazing! I’ve been looking for a new craft to take up and you’ve totally got me interested in this. That’s great! It really is simple once you practice the basics for a bit. I have a whole quilling for beginners page in my main menu if you need a place to start. If you ever have any questions, feel free to reach out! This is amazing, you’re very talented.